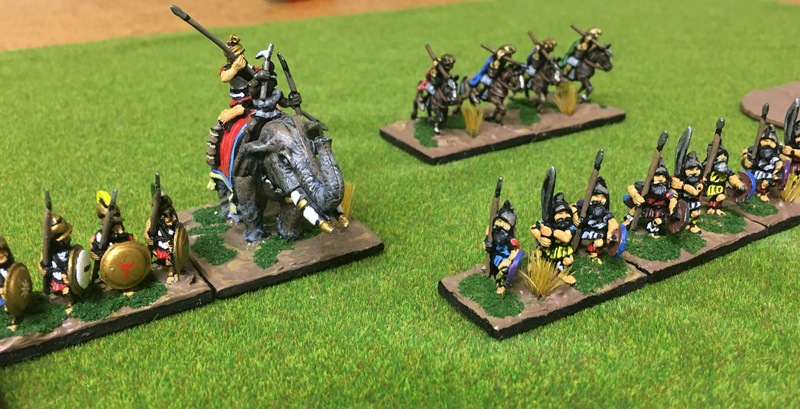 Last night we managed a 300 point game of DBMM using the latest version of the rules, v2.1. Given that it’s been a year since my last game of MM I expected to find the rules challenging. Indeed they were and while I can play DBR and DBA in the dark I felt as if I had a blindfold when playing DBMM such was, of course a combination of unfamiliarity and the level of additional complexity. Here are a few observations from the game for those interested in such things. Firstly, and to set the scene, we deployed on a table 1.2m in width and 0.9m deep, which was ample. 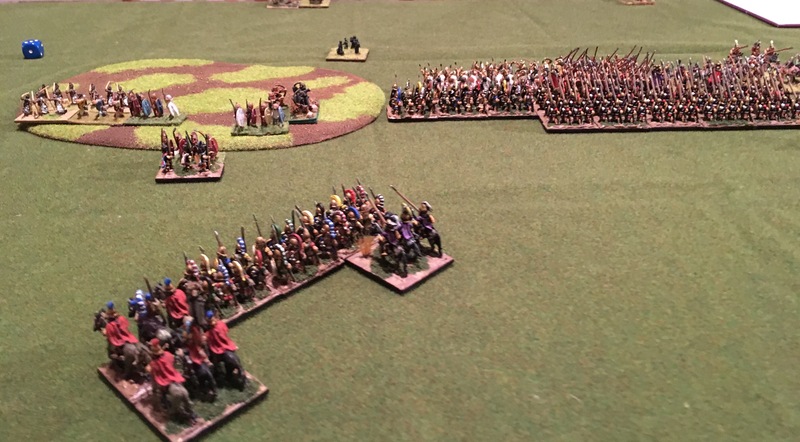 My Alexandrian Macedonian army of 300 points organised in three commands along with a baggage command. The Macedonians comprised a large phalanx which was supported by Greek hoplites, a few Thracian and Greek Auxilia as well as a number of Psiloi. The mounted were few in number with Macedonian horse on the right and Greek on the left. Alexander was campaigning as he would have been to brilliant by far. In opposition Jim deployed Graeco-Bactrian, but organised it into only two commands. 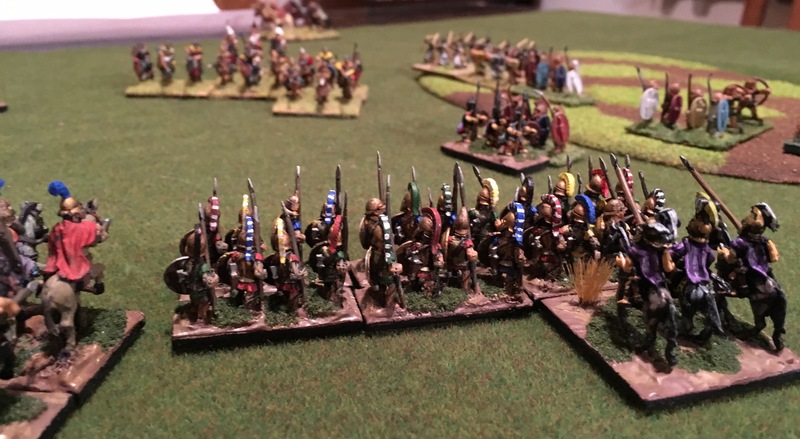 His phalanx was considerably smaller and a mix of Hellenic pike and Indian Spearmen. This was however well supported by Indian archers, military settlor thureophoroi and cavalry, the latter being a mix of Iranian lancers and Bactrians. The Macedonians deploying first, despite being the invader, which gave some advantage to the Graeco-Bactrians. It’s one of the little occasional extra bits to DBMM which adds flavour. The weather was uneventful. Aware of the massive advantage in mounted troops the Macedonian foot surged forward. The plan was simple. Defeat the enemy centre while delaying on the flanks as much as possible. Of course with all such plans it went off the rails almost immediately. The allocation of PIPs is like BBDBA, you allocate the highest die to a designated command, the next highest to another. So like BBDBA it’s important to have a plan. The Thracian foot, tasked with securing the rough ground on the left was first to suffer devastating archery and then a counter charge by enemy thureophoroi. The disastrous situation was recovered, somewhat, by reformed Thracians and some Cretan archers. Fortunately on the Macedonian right things went slightly better where Greek peltasts held the advances of another body of enemy thureophoroi. I learnt two clear points from these encounters. Firstly, the value of troops rated as “superior” when attacking and secondly the power of archers. I’m not completely sure I understand Phil Barker’s thinking around the superior grade, especially in relation to Auxilia. I’ll ponder this interaction further. 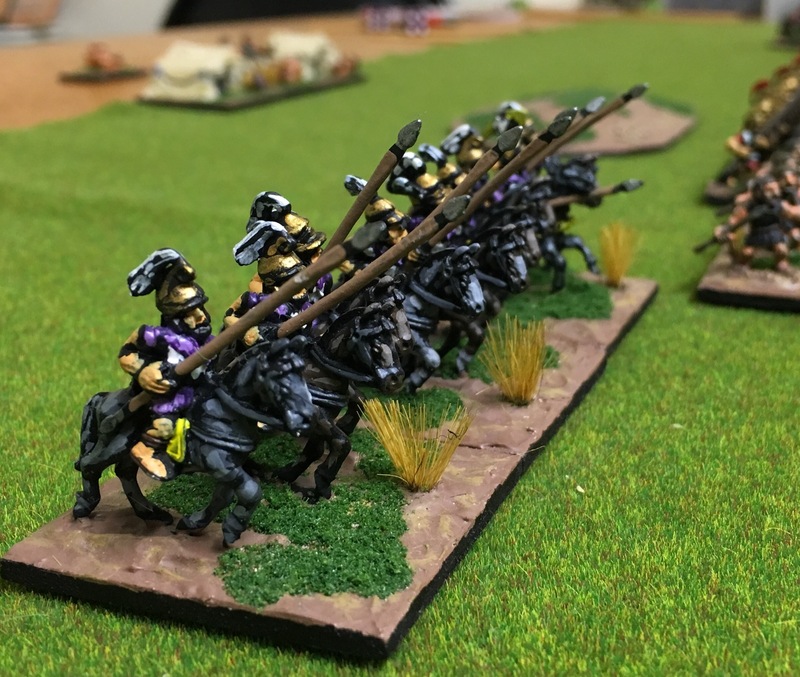 On the Macedonian left the enemy cavalry swept towards forwards. Careful use the Macedonian light cavalry however broke up the Iranians who struggled to manoeuvre with low PIPs. In time they broke up into a spontaneous charge. This part of the engagement illustrated well the restrictions on complex manoeuvres by both foot and mounted troops well. It’s reasonably complex but generally makes sense. In the centre of course the main lines soon clashed The Macedonian foot were proceeded by light troops whose javelins and archers broke up the Indian spearmen. As the light troops fell back the hoplites and phalangites pressed their attacks. In the resulting combats the opposing phalangites pushed and shoved each other with limited gain. 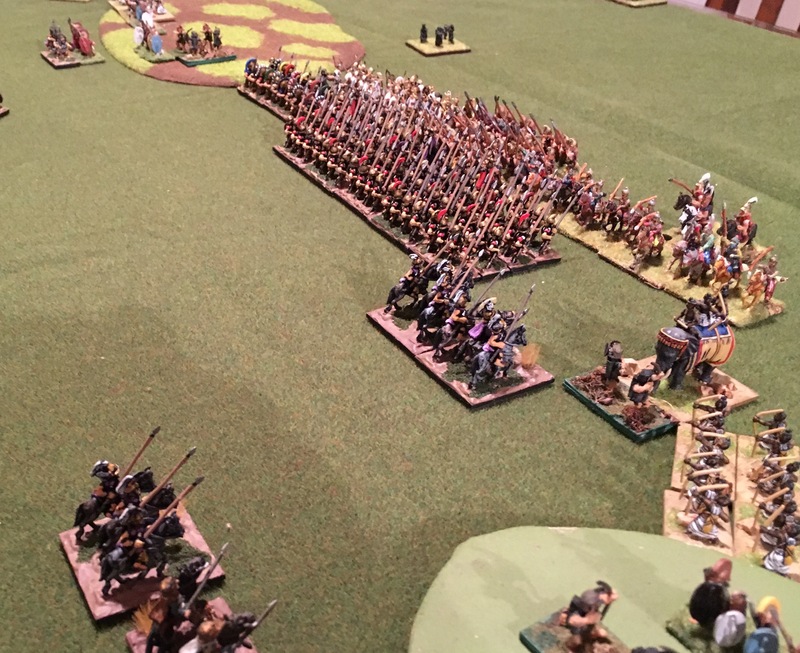 The Indian spearmen were however mostly pushed back with casualties. In MM the attacking pike, in deep formations, gain considerable combat advantage. It’s an interesting addition and is not surprising, though it adds additional complexity. It seemed to work well. Yet I generally feel the situation was handled well enough in DBA and while the complexity of MM was interesting it didn’t add significantly to the feel of the pike clash. I’ll certainly think some more on this. Unfortunately we made slow progress and we had to end the game before a result was determined. This slow progress is typical when playing a different rule set, indeed I always have the same problem when playing “Lost Battles” which I only play very infrequently. With practice speed will I’m sure be gained with DBMM, assuming I play it enough. Overall much of the complexity made sense and was intuitive which was, I thought, positive. Tomorrow evening another Successor clash is planned, this time with BBDBA. It will be interesting to contrast the two rule sets in games separated by as many days. 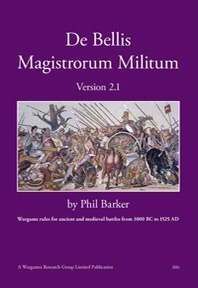 While my main Ancients wargaming these days revolves mostly around DBA I maintain an interest in Phil Barker’s other rule set DBMM. As such I have purchased each of the two previous versions of DBMM and played a handful of games. Today my copy of his latest version of DBMM was delivered, specificaly version 2.1. Ancients of course is fragmented these days, which I don’t believe is a bad thing. So why do I still have an interest in DBMM, when I play a reasonable amount of DBA? Well, DBMM has some appealing features for me. Obviously it provides some additional depth. Now I don’t want to spend hours playing a single game some extra depth can be appealing on occasion. I see DBMM’s additional depth in its special rules for weather, ambushes and stratagems. Now, I have no plans to build large armies but rather expect any games I play to use smaller armies comprised of 200 to 300 points, much like my 300 point DBR games and BBDBA armies. This latest version of DBMM, like DBA, is availiable as a hardback. It comprises 77 pages with a solid binding. The core rules run to around 40 pages. This is supported by around 17 pages of diagrams, which like DBA will add much to understanding of the rules. The most obvious change to the presentation, apart from the binding, is the increased font size. Hundred Years War English and Feudal French. DBMM 2.1 is on sale on Amazon in the UK and is priced at £17.99.